a. 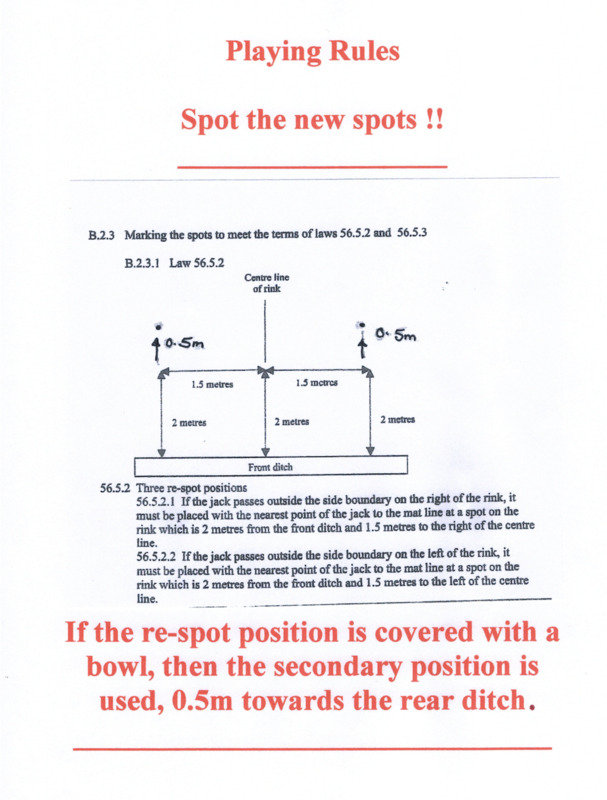 All Rules will be in accordance with the Publication “Laws of The Sport of Indoor Bowls,” published by the World Indoor Bowls Council (WIBC). Only the modifications outlined below will be incorporated for the Clubs Domestic requirements otherwise WIBC RULES APPLY. b. The Committee shall be responsible for reviewing these Club Rules as and when deemed necessary. ANY amendments can only be considered and implemented at the Annual General Meeting of the Club or ANY Extraordinary Meeting called to consider any such amendments. c. The Minimum Number of Members of any League Team shall be the number of Players required for that Leagues Format (i.e. Triples – 3 Players Registered) The MAXIMUM Number of Members will be 4 in the case of PAIRS and 6 in the case of TRIPLES and FOURS. d .Each Player shall pay a REGISTRATION FEE of £3.00 for each team that they are a Registered Member of. These fees shall be reviewed as and when deemed necessary. ANY amendments can only be considered and implemented at the Annual General Meeting of the Club. In addition to REGISTRATION FEE Normal RINK FEE shall be payable for each individual Player at the prevailing rate at the time of play. Two Points for a Win and One Point for a Draw. In the event of a tie at the end of the League Season. The Winning Team will be decided with the highest margin of Shots Difference. b. Ensuring each Match is played ON or BEFORE the Scheduled date of the Round. e. Ensuring that a SCORE CARD is completed and is submitted immediately after the completion of each League Round. That the SCORE CARD contains The Team Name: Playing Members Names: Each Ends Score: Date: The Round Number: After the completion of the Match the SCORE CARD must be signed by one Member from each Team. The Completed SCORE CARD must then be placed in the Score Card Box. f. It is the Captains responsibility to ensure that their Team Members follow the Clubs Dress Code. g. The Captain or their Nominated Team Member is responsible for their Team and their observance of the Rules of Play. A Reserve can play for ANY Team. a. A Reserve cannot be a Registered Player of any other Team that is competing in that particular League. c. A Reserve cannot Skip. fA Reserve can join a Team at any time during the Season by paying the relevant Registration Fee (£3) as long as they have not been registered to another Team in that League and that the number of registered players does not exceed that stated in paragraph 1 (c) above. a. ALL Matches MUST be played on or before the date scheduled in the Fixture list. If a Team wishes to play before the designated date, the Captain shall contact the Opponent’s Captain and agree on a mutually convenient date. The Result of that fixture, should it be played before the given date, will only appear on The League Table on or after the original date of Play. d. Games will only be re-arranged in exceptional circumstances. National Competitions and County Duties will generally be the only exceptions. (i) Telephone and inform in person the Opposition Captain and/ or Nominated Team Member. (ii) Telephone and inform in person The Domestic League Secretary. f. If after negotiations between Team Captains any matter still remains unresolved it MUST be brought to the attention of the Domestic League Secretary as soon as possible and then only by the Captain of the offended Team. a) All Domestic League Matches shall be of Two Hours Fifteen Minutes duration. (i) Pairs, Triples and Fours shall not exceed 18 ends. b. Skips may only visit the Head once in each End. Remaining at the Head whilst the Opposing Skip bowls counts as one visit for that end. e. A Bell shall sound 5 minutes before the end of each Two Hour 15 minute session. After the Bell has sounded :NO JACK SHALL BE CAST. For the avoidance of doubt the Jack must have left the hand with the mat in a correct position. The End is live even if the Jack has been mis-cast and the End must continue. f) The score shall stand as at the completion of the End being played when the Bell sounded. The Committee will, prior to the start of each Season, publish on the Clubs Website and Notice Board details of the various Leagues to be played. In general the existing Leagues will continue from year to year and, when it is deemed necessary, adjusted to suit the needs of all the Club Members. The Teams in Leagues described as “Mixed,” shall, when playing contain BOTH Ladies and Men. Those described as “Open” shall comprise of either all ladies, all men or ladies and men. 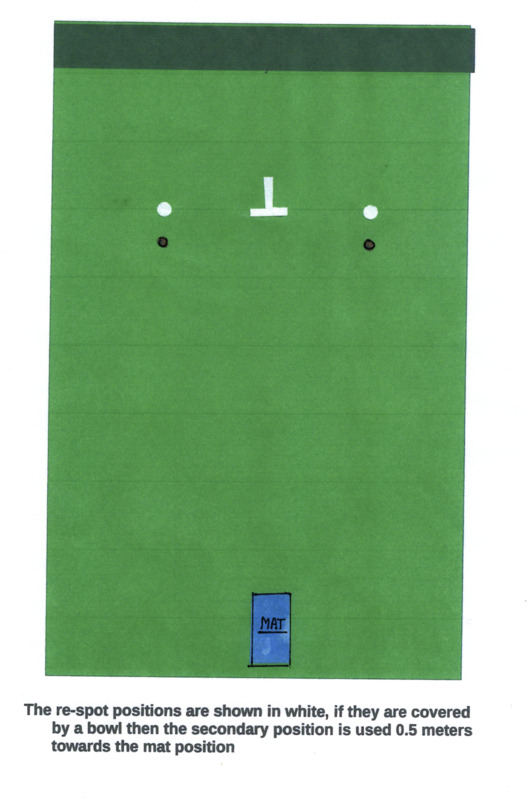 Should the jack be improperly delivered, the opposing player may then move the mat in the line of play and also place the jack at any point in the line of play ensuring that it is centred providing it complies with the minimum distance a jack should be cast but shall not play first. (i) It passes beyond the confines of the rink in play. (ii) It passes wholly beyond the boundary of the rink. the jack shall be placed on the nearest of the two side spots either side of the “T". If a player is unable to complete the match due to injury or illness - the match score will stand if more than 12 ends have been completed. If less than 12 ends have been played - the match can be rescheduled and beginning again at the end the game was stopped with the score being carried forward. This applies to 'Pairs' but in the case of Triples or Fours the match can be continued with one less player i.e. Triples = 2 players and Fours = 3 players using the prescribed format. Thanks to club coach Cliff Goddard for guidance and the illustrations.